Kabul: More than 17 years after the United States’ invasion of Afghanistan, Washington and the Taliban appear closer than ever to some sort of agreement that could bring the insurgents to the table for peace talks. News from Afghanistan peace talks, as relayed by the US special representative for Afghan reconciliation after meetings with the Taliban, has been “encouraging”, US Secretary of State Michael Pompeo said. “The US is serious about pursuing peace, preventing Afghanistan from continuing to be a space for international terrorism, & bringing forces home,” Pompeo tweeted. Earlier, Zalmay Khalilzad, the US Special Representative, said in a series of tweets that the parties “made significant progress on vital issues” after six days of talks in Doha. The US and Taliban representatives have held several rounds of negotiations in recent months, part of a diplomatic push to get the insurgents to agree to peace talks. The latest session ended in Qatar on Saturday after six straight days of negotiations — the longest consecutive sit-down between the two sides to date. Saudi Arabia, the UAE and Pakistan have also all participated in the talks. The Taliban are negotiating from a position of strength: They have the upper hand on the battlefield, and US President Donald Trump’s reported eagerness to start withdrawing troops from Afghanistan is weighing heavy on the discussions. Ostensibly to find a way to bring the Taliban to the table for peace negotiations with the government in Kabul to end the Afghan conflict. Doing so could require some movement on longstanding demands from both sides. 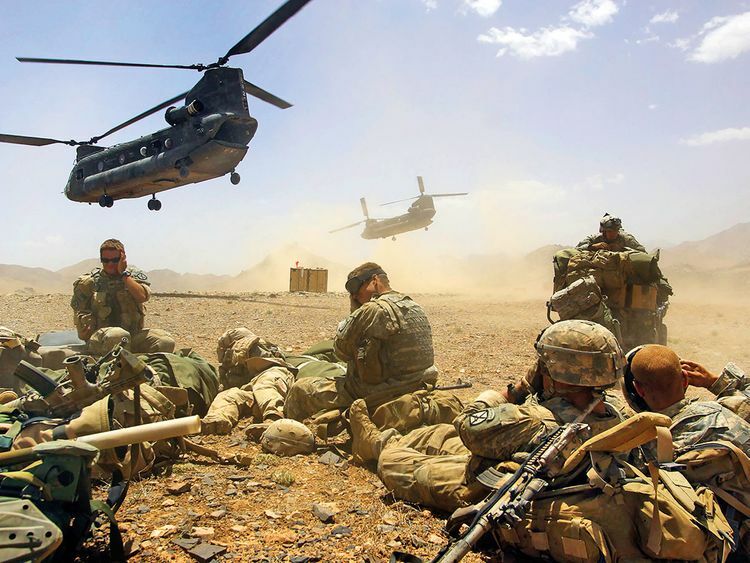 For the Taliban, that includes a timetable for the withdrawal of foreign forces in Afghanistan, while the US is seeking promises that Afghanistan will not be used again as a base for militants to launch attacks on foreign countries. Other issues include a potential ceasefire, a prisoners exchange, and ways to bring the Taliban into the political mainstream without undermining the legitimacy of the elected government in Kabul. The Taliban is widely believed to want a return to power in Afghanistan and to reimpose shariah, although there is some uncertainty over whether they might loosen their hardline stance after a US exit. The talks ended in Qatar on Saturday with key parts of a draft pact mapped out, including an 18-month timeline for the withdrawal of foreign troops after the completion of a deal, according to Taliban officials. The draft also includes assurances from the hardline group that it will not allow Afghanistan to be used by Al Qaida and Daesh to attack the US and its allies — a core US demand. Similar assurances involving other groups are given to Pakistan in the draft pact. The Taliban also want to be part of an interim government after any ceasefire, Taliban sources said. It was not clear whether the draft described by the Taliban sources was acceptable to both sides or when it could be completed and signed. What is Khalilzad’s role in the process? Khalilzad appeared upbeat, saying that the talks were “more productive than they have been in the past. We made significant progress on vital issues”. He arrived in Kabul on Sunday to try to secure cooperation from Afghanistan’s president after breakthroughs in peace negotiations with Taliban leaders in Qatar. With Khalilzad and his boss Pompeo, as well Taliban officials, hailing progress towards ending America’s longest war, he must now win over President Ashraf Gani — whose government the Taliban have so far kept out of the process. The Taliban have said they are planning to “share details of the meetings and receive guidance” from their leaders before moving forward, and vowed to resume “similar future meetings”. A fresh round of talks between Khalilzad and the Taliban is expected to take place on February 25 in Doha, two senior Taliban sources said. While he has not been directly involved up until now, Gani’s role is likely to grow as a full deal gets closer and diplomacy intensifies. Without going into detail on Saturday night, Khalilzad said in tweets that nothing could be agreed without an intra-Afghan dialogue and a full ceasefire. “He (Khalilzad) will inform Gani and his officials about all the developments, seek their opinion before travelling back to Washington,” a senior Afghan official said. Khalilzad is also due to brief top regional diplomats on Monday morning. What role is the Afghan president expected to play? Western diplomats describe Gani as being in a tight spot, with no authority to decide on the troop departure and the final decision to declare the ceasefire resting with the Taliban. He, however does enjoy the power to decide to support an interim government rather than push for presidential elections which could prove to be a distraction to the peace effort. So far he has rejected talk of an interim government. “It is time for Ghani to choose between elections or peace process,” said a western diplomat based in Kabul. Will there be a visible change in Afghan violence? Despite the progress on a pact, violence is widely expected to continue, with the Taliban mounting daily attacks against the Afghan government and its security forces. The Taliban now control about half of Afghanistan’s territory and Ghani said in Switzerland last week that 45,000 members of the country’s security forces had been killed since he took office in 2014. A former Taliban leader said despite a agreement for an 18-month withdrawal, he predicted intense fighting ahead. “I think Taliban won’t stop their fight until they get 100 percent sure that foreign forces are leaving Afghanistan,” said Sayed Mohammad Akbar Agha, who heads Ways to Save Afghanistan, an independent group run by tribal elders and religious scholars working towards securing peace. “There are too many unknowns ... this is just a beginning,” analyst Borhan Osman said. “Nobody should underestimate the complexity and delicacy of the way forward from here.” The major sticking point remains the Taliban’s flat refusal to speak with the Afghan government, whom the insurgents brand as “puppets” of the West. Even if the US and Taliban can agree on a mechanism that would bring the militants to the table with Kabul, however, any specifics will then be the subject of “thorny negotiations, in a long battle of wills among more stakeholders than the Taliban and the US”, Osman warned. Last year, Gani had offered a peace plan that encompassed a ceasefire and called for bringing the Taliban into the political mainstream. However, the Taliban’s response was lukewarm at the time and experts said they had no reason to expect that stance to change. “The Taliban will not agree to a power-sharing deal,” Afghan analyst Nazar Mohammad Mutmaeen said. A US exit without some sort of rapport between the Taliban and Kabul could be disastrous. There are fears that Afghan security forces — already taking what experts have described as “unsustainable” losses — could break down along ethnic lines, unleashing an even bloodier civil war or even ushering in the return of a Taliban regime. Pakistan’s Minister for Foreign Affairs Makhdoom Shah Mahmood Qureshi on Sunday said Pakistan played its role for peace in the region by bringing Taliban, Afghan government and America at the dialogue table. Being a well-wishing neighbour of Afghanistan, Pakistan was duty-bound to render its important role for peace in Afghanistan, he said while talking to the media in Multan, Pakistan. He said peace in Afghanistan was of vital importance and also the need of Pakistan. “We have been hosting and serving the Afghan immigrants for the last many years,” Qureshi mentioned. He said Pakistan had neither intended to meddle in the internal affairs of Afghanistan nor would it do so in the future. The foreign minister said Pakistan would succeed in re-setting its relations with America. The PTI government would not compromise on interests of the country, he added.